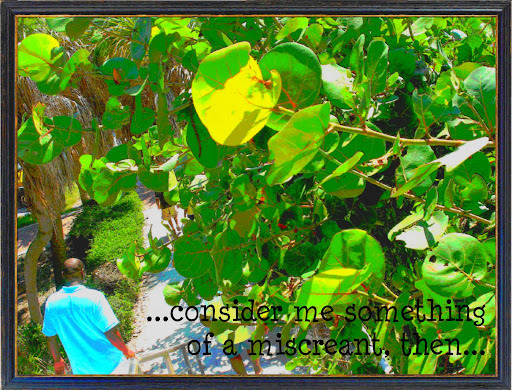 ...consider me something of a miscreant, then...: "sometimes, I cry..."
I was lying in bed, no more than a minute or so ago, listening to this (what I assume could be new just found out is new) song by Eric Benet, called "Sometimes I Cry." (Well, that was the hook.) It's him, singing almost completely in falsetto, talking about how he had this girl he was really into, but she's gone, and he hopes that she's happy with her new man and new situation, and how it's taken him a long time, but he essentially has gotten to the point where he thinks he's fine... and then he realizes he's going to have to "fake it to make it," meaning that he's not really completely okay without her, and that sometimes he cries over her present absence. Oh, do I know all too well what that's like. Anyway, my point wasn't to write about me being familiar with that. I was lying in bed, intending to go to sleep, but my body wasn't ready. I was half lying (down)/half sitting, listening to the song, knowing that his picture was in my periphery--this isn't me being literary, either. His picture is literally in my periphery right now. There's a line in the song where Benet says that he met a new girl, and that she has been good for him, and I immediately thought of how much I wouldn't like to hear that coming from him (knowing that it's serious, and that he's not just tasting the flavor of the season), and how much it hurt when the ex (you know, that other one) told me he met that girl that could be the one... and then I started thinking about that girl in Benet's line, the one who was good for him, and how often in life, whether we realize it or not, we are stepping into other people's shoes. How often in life, have we met people and been a bridge for them to get over something significantly damaging? (And no, rebounding doesn't count. That's generally always physical anyway.) When I entered his life, and he mine, I never thought about things like this. Sure, I was off the heels of some fleeting romantic endeavor with a guy (who is now my good friend), but it was nothing serious enough for me to be distraught. I was definitely upset, but rather bitter about men in general when I met him by happenstance*, not sad and looking for someone to be good for me. But as I found out later, I could have easily been a bridge for him. He had just left an over-a-year-long relationship with his girlfriend when we met. Two weeks before we met. So maybe, I was a bridge for him. Maybe I was that new girl who was good for him. Maybe that's why things didn't last and maybe that's why things are the way they are now. I wonder if I was a bridge for the ex. (You know.) Maybe I really was the girl that gave [him] hope**, and maybe I was the bridge for him from cynicism to hope. Maybe I was meant to be that bridge so he could go on and meet that girl who could be the one, that girl who is now his wife. Maybe I played some hand in that. I know he was a bridge for me, one that took a long time to cross. I've been thinking about him again lately; in fact, "thinking about him" is not the right terminology, because I haven't been actively thinking about him, for there's nothing current I could think about. His memory has been floating around in my head, igniting my imagination and sparking my curiosity as to what type of friends we could have been if our relationship had fought the dying light of Fall. I've gone on a tangent before bedtime, postulating about all of these relationships and wondering about bridges. What I really wonder is, when have I been that, she's good for me girl? And, am I really comfortable being that girl, imagining that my time with the person I'm good for is clearly ephemeral? *--though I like the word happenstance, I don't believe in chance, luck, or coincidence. Our happenstance was divine placement. **--his quote, not mine or Eric Benet's, and yes I remember it like I just heard it. Some things you never, ever forget. I'm honestly at a lost for words. Wasn't sure where this post was going, and I was def thrown for a loop with what I'll call your "bridges theory". Now I'm thinking about if I've ever been a bridge,lol. Thank you lady. I seriously heard the song and bolted up in bed and then this post flew out of me. I'd never thought about this before, ever.